(Phys.org)—A trio of researchers, two with the University of Tübingen in Germany, the other the University of California has found evidence that suggests it is not possible to tell if marks on some ancient artifacts were made by ancient hominids using stone tools or by crocodiles. In their paper published in Proceedings of the National Academy of Sciences, Yonatan Sahle, Sireen El Zaatari and Tim White describe their study comparing bite marks made by stone tools and crocodiles, what they found by doing so, and what it might mean for research results made by other teams. 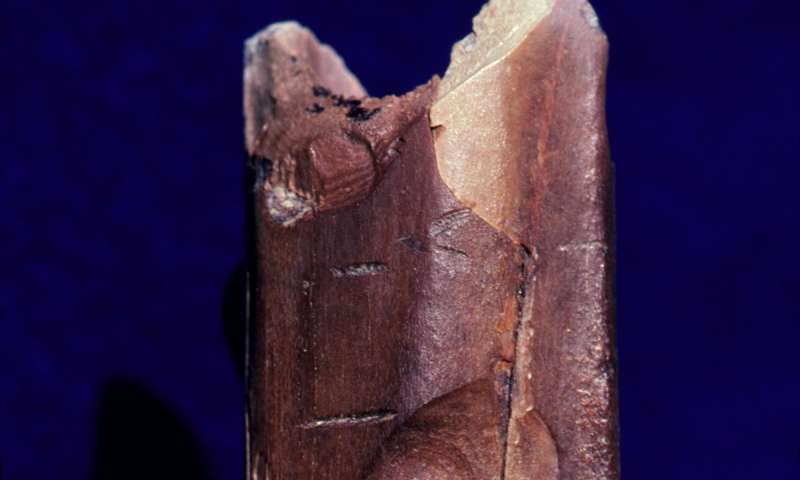 In recent years, several teams of archaeologists have made claims regarding the earliest use of tools by hominids, some going back as far as 4 million years. These new studies have used evidence of marks on animal bones as proof of tool use, rather than actually finding stone tool artifacts. In this new effort, the research trio suggests that marks on bones do not appear to offer strong enough evidence of tool use. For many years, scientists in the field have believed that when animals make marks on bones, the results are U-shaped, whereas those made by stone tools are V-shaped. But that, the researchers point out, was based on studies of hyenas. 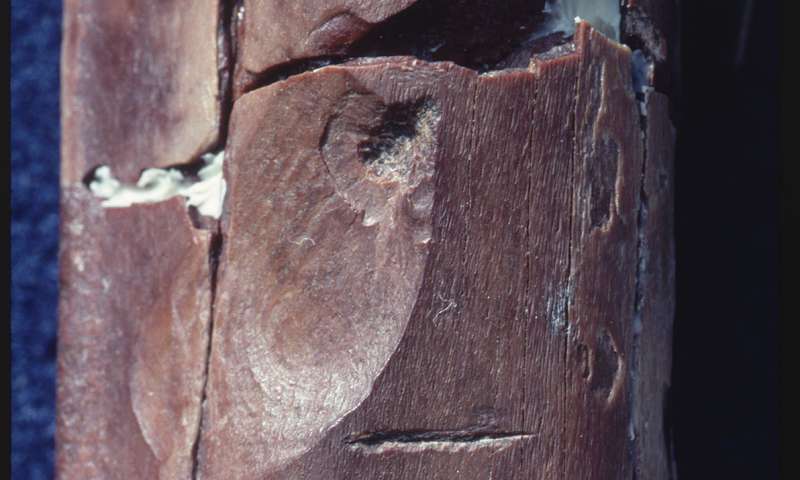 In running their own tests, they compared crocodile bite marks to stone tool marks and found them very nearly identical. To learn more about stone tool markings, the researchers used actual stone tools to butcher some sheep. To learn more about crocodile markings, they studied work done by Jackson Njau, who, in 2006, documented bite marks made on animal bones by crocodiles living on an animal farm. When they compared the marks they had made on the bones with those shown by Njau, they found them to be virtually indistinguishable, even at the microscopic level. This, the trio suggests, indicates that using bite marks found on ancient bones as evidence of stone tool use is premature. They believe the marks could just as easily come from crocodiles, which, they note, lived in the areas where the ancient bones were found. Zooarchaeologists have long relied on linear traces and pits found on the surfaces of ancient bones to infer ancient hominid behaviors such as slicing, chopping, and percussive actions during butchery of mammal carcasses. However, such claims about Plio–Pleistocene hominids rely mostly on very small assemblages of bony remains. Furthermore, recent experiments on trampling animals and biting crocodiles have shown each to be capable of producing mimics of such marks. This equifinality—the creation of similar products by different processes—makes deciphering early archaeological bone assemblages difficult. Bone modifications among Ethiopian Plio–Pleistocene hominid and faunal remains at Asa Issie, Maka, Hadar, and Bouri were reassessed in light of these findings. 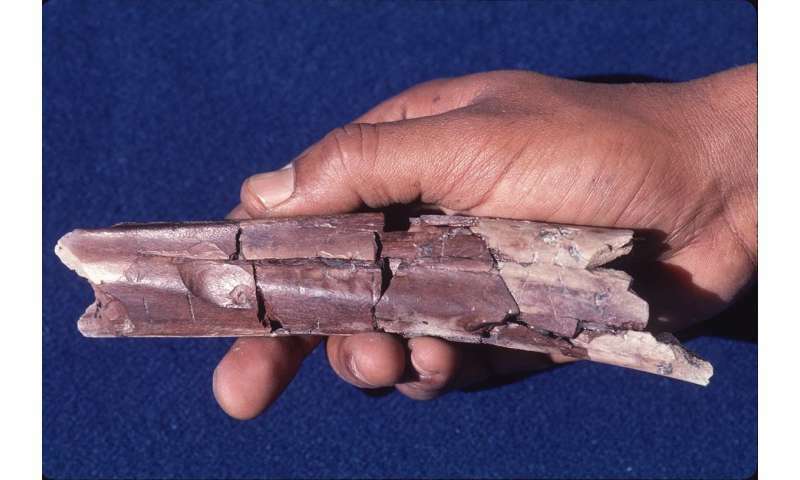 The results show that crocodiles were important modifiers of these bone assemblages. The relative roles of hominids, mammalian carnivores, and crocodiles in the formation of Oldowan zooarchaeological assemblages will only be accurately revealed by better bounding equifinality. Critical analysis within a consilience-based approach is identified as the pathway forward. More experimental studies and increased archaeological fieldwork aimed at generating adequate samples are now required. Having a degree in Archaeology, I have always been skeptical of ancient lineages, and artifacts, as there are so few of them and they are scattered across huge time frames, it is impossible to draw many of the conclusions that have been made.